Though we’re still struggling with speed issues on the Mac, we were able to squeeze in our second photo service for uploading and browsing photos: Photobucket! Download the latest release and check it out. Open up Flock’s Preferences dialog, click the Web Services tab, choose Photo Sharing and then select Photobucket from the dropdown menu. Switching photo services requires Flock to be restarted, and you’ll be prompted to do this after making your selection. After switching services, the Photo Browser and Uploader interfaces will change to reflect the feature set of the new service. Oh, and we also took care of a nasty bug that would mangle title, description, and tag fields when using multibyte UTF-8 characters in the Photo Uploader. 1. New web site are saved in Favorite Manager and Flock Faves Toolbar while Flock is running. After Flock is relaunched, some of the web sides are deleted. I’ve tried it about four times and the problem recurs. This is something new. It did not happen with previous version. Your comments will greatly appreciated. I’m feeling a little bit down right now. Never had any problems with Flock before. Will look into it. Thanks for the tip! Thanks for your prompt reply. Just to let you know, I’ve been testing the new upgrade all night and my main problem is still saving web sites in Favorite Manager and Flock Faves. This is great problem if you can’t bookmark websites. I’ll be waiting in the wings for your findings. It’s two o’clock in the morning, Panama time and getting sleepy. I think I’m going to “hit the sack”. epiac, are you using del.icio.us with Flock? This may not relate to the update, but with a change on del.icio.us that we currently urgently investigating. 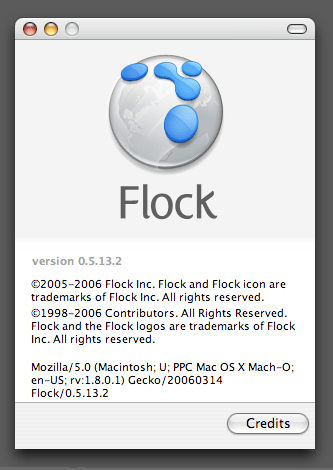 Yes, I’m using del.icio.us with Flock. As a matter of fact I’m using this application as well as Shadows. I’ve stated before that I never felt comfortable with del.icio.us. I prefer the traditional Bookmarks used by Opera, IE and Firefox. Will wait until you guys come up with an answer. Today will test Flock with Photobucket. Bookmarks *are* broken — in so much as the current model doesn’t scale or adjust to accommodate the limitations of human memory. Tags are a much better way of organizing things because they allow you to create taxonomy on the fly, as well as use multiple words to classify an item. Folders force you to use one category to describe the thing, which doesn’t help with recall at all. Beyond that, there’s no way that you’d be able to get a service to sync with an infinite number of nested folders… tags are much easier to scale and synchronize. So if you want to take your bookmarks with you, and get the benefits of categorization, tags and one-level-deep collections are the way to go. It’s not like we’re doing it just because it’s fashionable or anything. It really does make sense from many perspectives! Congrats on keeping up the releases! I really think that a steady stream helps build and maintain interest, at least in geeky stuff like this. Funny thing about Photobucket is that it seems like trailing edge tech when compared to other image hosters, yet it works splendidly and efficiently. Even with Xanga’s image hosting enhanced, I prefer using links to Photobucket for my Xanga blog. And thanks for stopping by my LJ — I’d thought I was just muttering to myself; I only noticed your comment today!